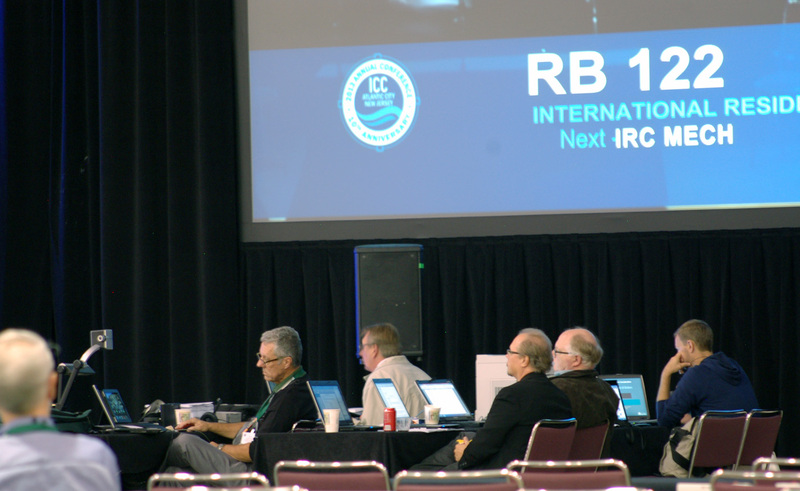 The International Code Council (ICC) presents hearings for the public considering new building code proposals. Meetings are scheduled semi-annually. Each hearing attracts upwards of 3000 participants including building inspectors, architects, fire marshals and others interested in promoting safe building construction. 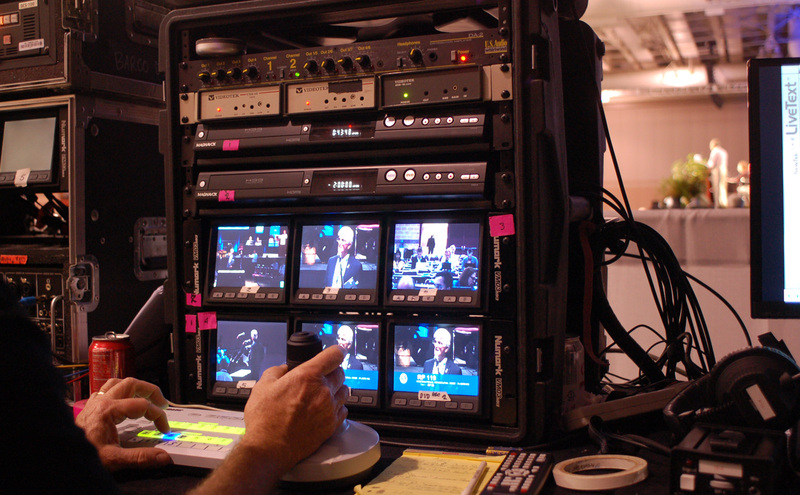 The ICC multi-camera production schedule includes up to 3 days set-up on location; up to 2 weeks of live production from 8 am to 10 pm and usually 1 day for breakdown. In addition, the production requires 3 tractor-trailers, and approximately 15 to 20 full time workers in 2 shifts. Below are photos with descriptions of the Atlantic City Final Hearings in October of 2013. This website is not presented by ICC. It was built by Jim Powell and is solely for the purpose for demonstration in a live multi-camera operation. Photo are presented with permission. All photos are Copyrighted by the ICC. Any reproduction is strictly prohibited. The full stage includes 2 large screens for program and the center screen for commercial and other presentation. Notice the lower third on the right screen. 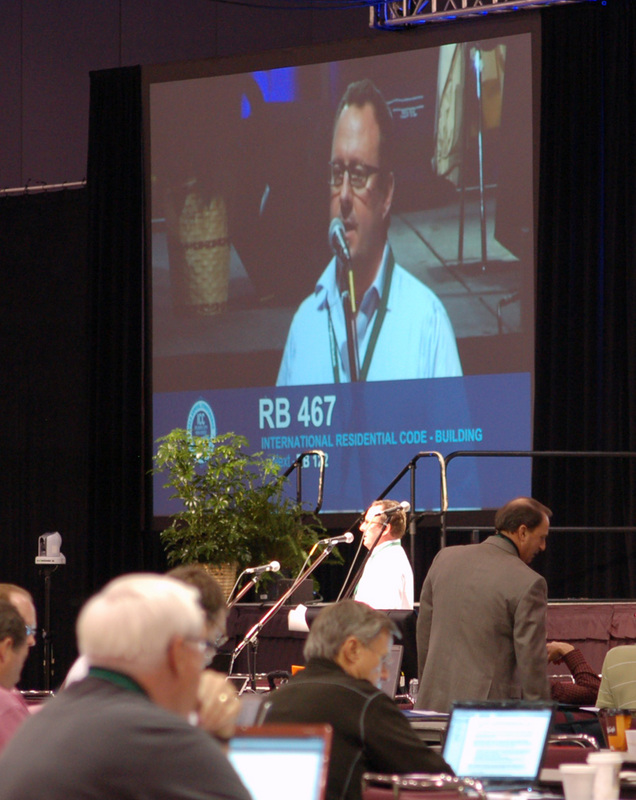 The first line (RB 467) is the present 'building code' being debated. The line at the bottom (RB 122) is the next code on the agenda. This is the ICC Final code hearing, meaning it is the last debate before a code is authorized or denied. 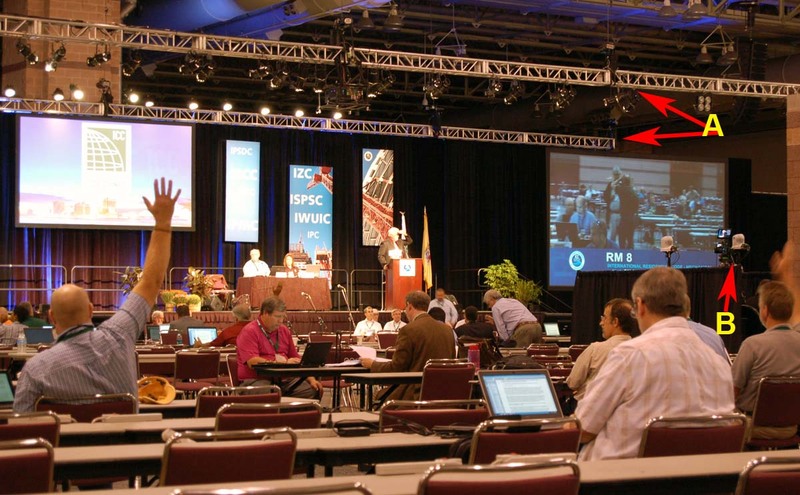 In the preliminary or first public hearing, 2 full banquet halls are running simultaneously with a second full set of identical equipment. In that production, another text block is added to the lower third in the right lower corner. It will present which code is being debated in the opposite room. Speaker testifying. Notice audio floor monitor at the bottom of the mic stand and video monitors at left. TriCaster Control. Monitors include "Live text (lower thirds control)" at left. To the right of this monitor is the "Program" monitor with 2 monitors at the far right for the "TriCaster 855" operation. 2 DVD recorders are used in our production with one always active. The purpose of 2 is to overlap the recording from the ending of one machine to the next. In addition to these recordings, the program is also recorded to hard-drive and broadcast over the Internet. Also, the audio is separately recorded. 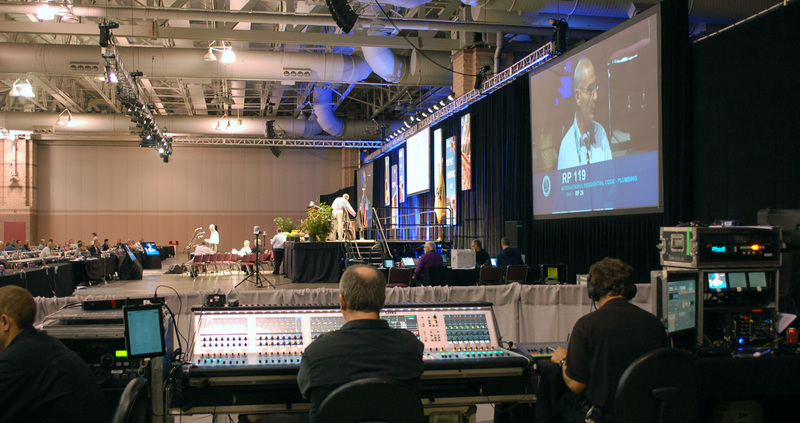 Audio provides all incoming and outgoing audio signals including sound reinforcement, delays and enhancement. We have as many as 17 microphones on stage with 4 on the floor at one time. 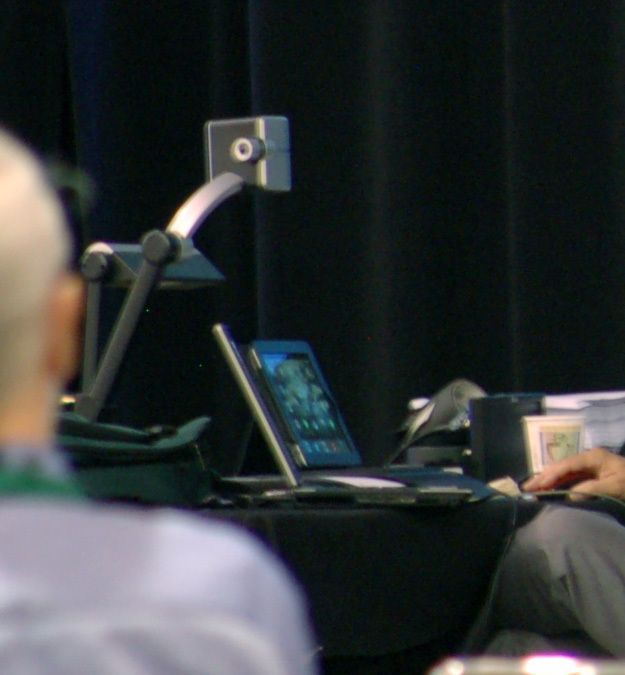 In our ICC ES hearings, up to 28 microphones are used. This website is not presented by ICC. It was built by Jim Powell and is solely for the purpose as a case study in multi-camera operation. The above is presented with permission. All photos are Copyrighted by the ICC. Any reproduction is strictly prohibited.